Most of us are generally unaware of the specific quantity of a product when it comes to releases and that’s fine. It doesn’t really seem like that big a deal. Okay, we are aware of its status be it ‘limited’, ‘extremely limited’ or even just a general release and from this we can gather a rough quantity that allows us to prepare our obtainment plans and whether a campout or proxy may in fact be needed. What we don’t know in knowing quantities though would unveil an ingenious side of Nike that most of us would never have seen otherwise. Nike in fact control release quantities so precisely that it controls the resellers market and they have been on it for years. Obviously trainers have been a huge thing since their dawn however, more recently the co-pilot on this flight the resellers market has become disturbingly large too raking in, as a whole millions of £ a year! There’s nothing that can really be done to stop someone buying a limited release and then selling it for double the price. Hype is such a real thing that due to the limited number or the fact that Kanye was seen in a pair people are willing to pay these ridiculous prices and then proceed to have some inner feeling of exclusivity in having something no one else has (can afford to have). Campless (trainer statistics) estimated 96% of the trainers on the reseller market are Nike branded so it’s no wonder Nike decided to get involved. 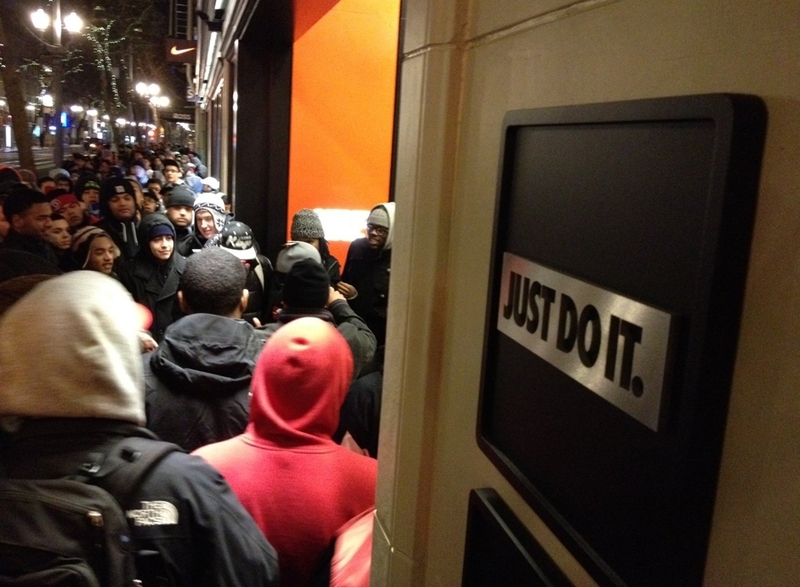 They also estimate that only 4% of these releases actually make it to the resellers market. This is due to the previously mentioned conservation methods from Nike with precise quantity control. They have to assume on popularity of a particular shoe and act accordingly so that there is enough made for everyone who actually wanted a pair and not so much left over (to put it simply). Very occasionally there will actually be a very limited run of a particular trainer and that will go the way of the reseller or the lucky but more recently Nike are also trying to get around and discourage the use of Bots through verification methods. Nike have also just announced that they will in fact be utilising the raffle system with some of their bigger releases and to be in-store only. You will have to apply via a twitter link, signing into your Nike+ account and then waiting 24hours for the winners to be selected. The email will entail a location and time for you to pick up your pair following a payment. This is only currently being trialed in the states however if things run smoothly then we can only assume we will be using it over in Europe soon enough. My only thought and concern for Nike would be that- If bots and resellers are cut out of the equation, would every one of their releases sell out like they normally do? I think most of us can thank the vigilante- Nike in it’s attempts to abolish and control the resellers market in such a candid way.